Korail’s newly launched West Gold Train line runs along the West Coast and through Gunsan in North Jeolla Province, one of its seven destinations. Gunsan is nestled on the north edge of the Okgubando Peninsula, a jut of land defined by the Geumgang River to the north and the Mangyeonggang River to the south. The city also officially covers a group of nearby islands, known as the Gogunsan Islands. With a present day population of approximately 270,000 and an area of 680.76 square kilometers, the city has been known throughout its history as a hub of trade. Early in Goryeo (918-1392) and Joseon (1392-1910) times, Gunsan served as a port where ships carrying rice toward Seoul and beyond laid anchor. The region also housed a number of large warehouses that stored great qualities of grain produced in the fields near the mouths of the Geumgang and Mangryeonggang Rivers. The city’s role as an important base for trade continues up to today. Since Gunsan Port was first opened to non-Korean traders in 1899, the city has expanded with goods constantly coming in and out of the port. It kept leaping forward rapidly, especially between the 1930s and the 1940s, times when modernization set off in earnest across the region. The city has now positioned itself as the centerpiece of the domestic rice trade and rice exports in general, and as a city that has helped to reinvigorate such interactions. 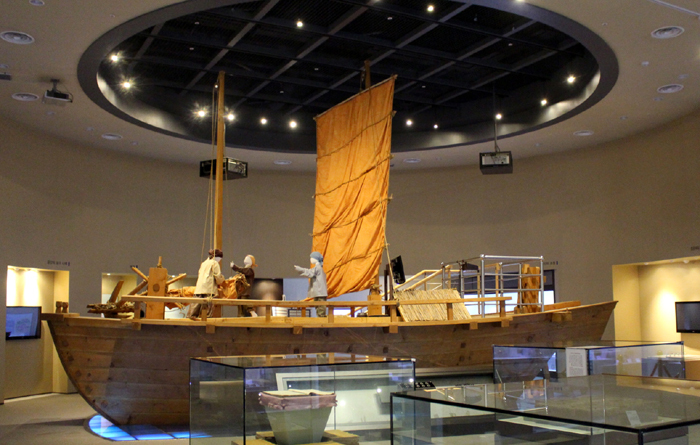 During colonial times, Gunsan served as the largest center for rice exports to Japan, shipping the bounty of the Honam Plains of Jeollabuk-do back to the Japanese home isles. 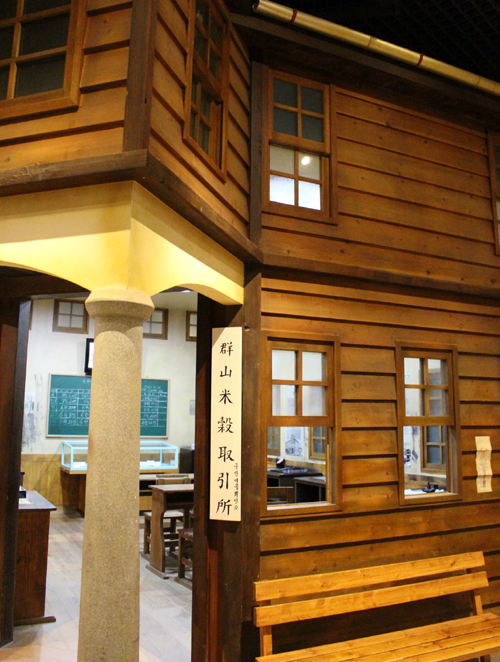 Pictured is a replica of a rice exchange where rice transactions took place during the early 20th century, on display at the Gunsan Modern History Museum. Not only capitalism, but traces of imperialism took root across the region as well. 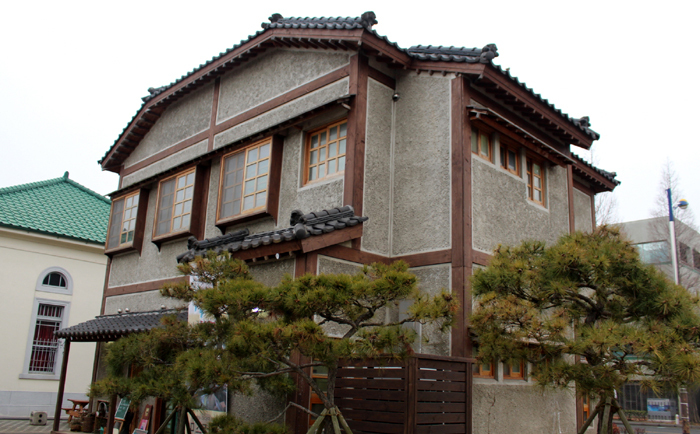 Such traces from early modern times can be found in every nook and cranny in downtown Gunsan. The city has proclaimed a modern historic district to preserve the buildings and legacies. Though built under an exploitative colonial system, they are part of the city’s actual history and they serve as a lesson and as a reminder for future generations. 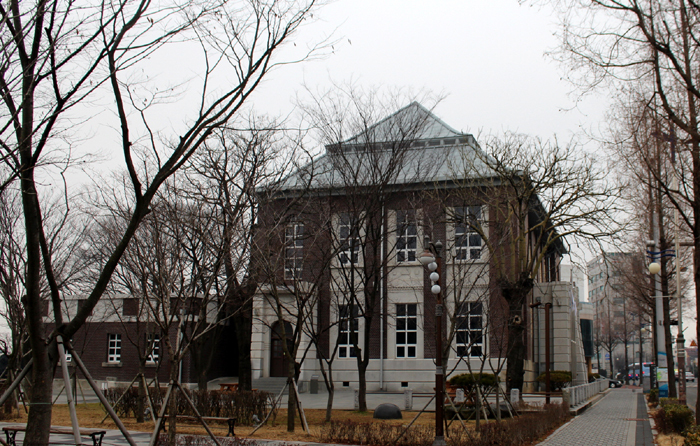 There remain numerous European–style buildings from Japanese colonial times in downtown Gunsan. 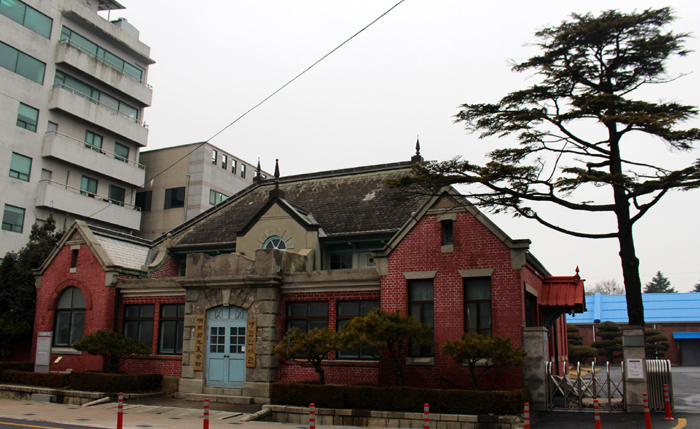 From top: a branch of the former Japanese 18th Bank Gunsan Branch (日本 第十八銀行), and (bottom) the former Chosun Bank Gunsan Branch. 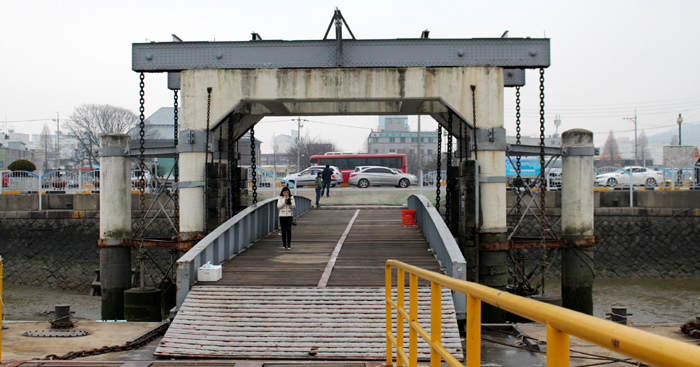 A floating bridge at Gunsan Port is designed to rise and fall with the large tidal range during the Geumgang River’s ebb and flow. 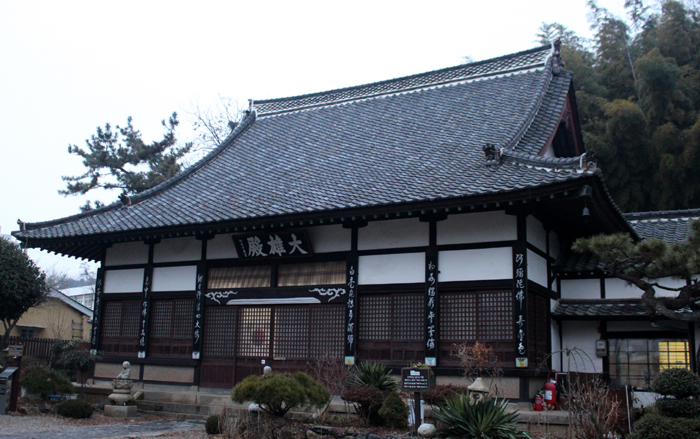 Dongguksa Temple(東國寺) is the only surviving Japanese-style temple in Korea. 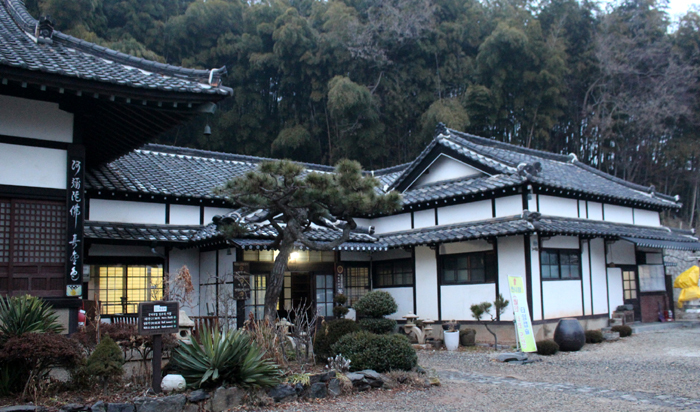 It opened its doors in 1909 and is run by monks of the Japanese Caodong school (曹洞宗). At the time of its foundation, it was called Geumgangsa Temple (錦江寺). 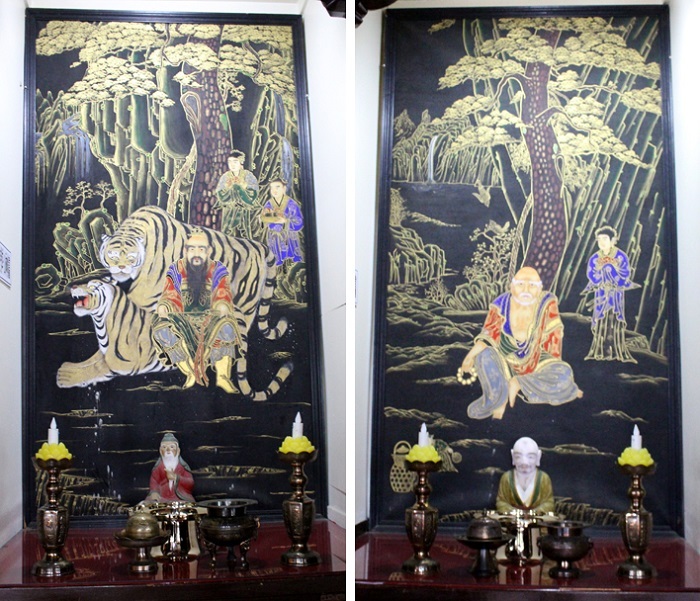 Inside and hanging on the walls are altar portraits of Buddha that portray images related to the nation’s folk beliefs. 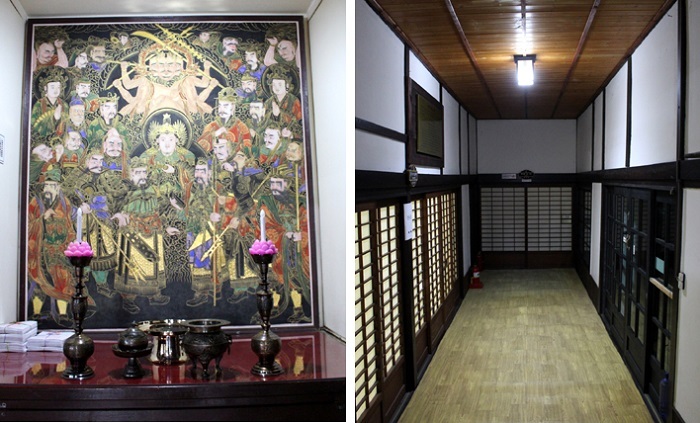 Pictured (bottom right) are traditional Japanese-style floor coverings. After the nation’s liberation from colonial rule in August 1945, however, the city’s seemingly unstoppable prosperity came to a halt and went into limbo. All transactions at the port that relied on Japanese capital were completely cut off. In addition, during the industrialization period after the 1960s, the city fell far behind in terms of development, as it relied on only primary industries and the food processing industry. Starting in the 1990s, Gunsan started turning to secondary industries that focused more on heavy industry, on par with China’s rapid economic growth. This was made possible thanks to the city’s geographic location, halfway along the West Coast and facing mainland China across the West Sea. The Saemangeum Seawall connects the peninsulas of Gunsan and Buan in Jeollabuk-do. Kicking off in 1991, major construction of the seawall was completed in 2010. It created extra land that measures 401 square kilometers. Located off the West Coast, facing China, the reclaimed land is expected to serve as the centerpiece of the Northeast Asian economy. 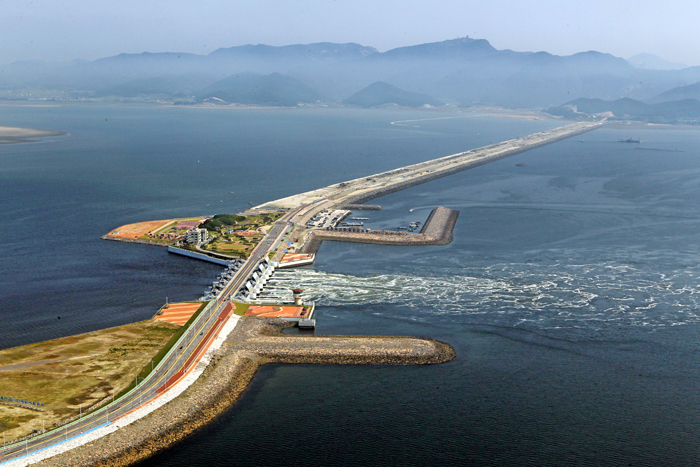 Just south of Gunsan, construction of the Saemangeum Seawall, the world’s longest man-made dyke that measures some 33 kilometers long, also serves as a turning point in the growth of the city. The project has made a milestone attempt at reclaiming land from the sea, linking Bieungdo Island and Sinsido Island with Daehang-ri in Byeonsan-myeon, Buan-gun County, to the south. The seawall has been under construction for more than 20 years. Gunsan continues to grow with the times. There are only small bits of construction remaining along the seawall, finalizing the reclaimed land. An international marine tourist zone on the Gogunsan Islands, a group of islands jutting out southeast of Gunsan, is being constructed. Finally, a tourist fishing port on Bieungdo Island is soon to be completed. Gunsan is transforming itself once again into one of the nation’s most international cities, building on its geographic location and reclaiming its role as a maritime center. This article was made possible in cooperation with Korail and the tourism promotion department in Gunsan City.